Free trade agreements are a recurring topic in the debate about Norway’s relationship with the EU. 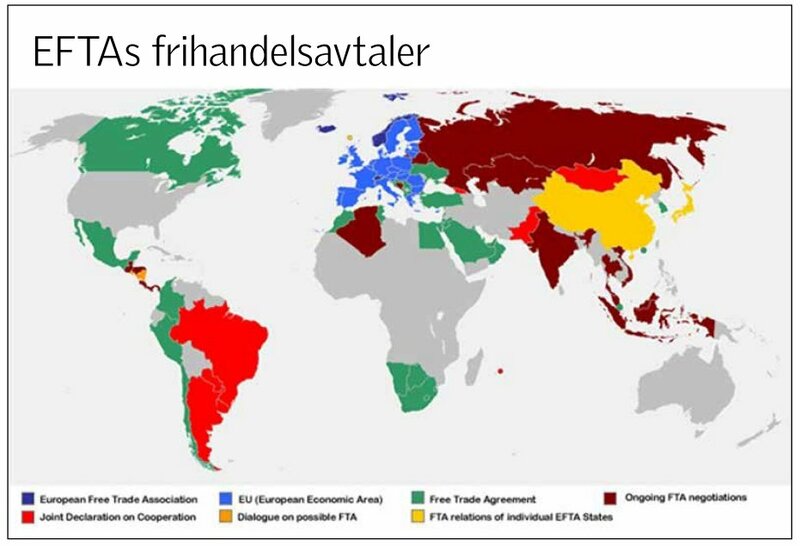 Most of Norway’s international trade agreements have been initiated through the EFTA Free Trade Association. The member countries of EFTA are Norway, Iceland, Switzerland and Lichtenstein. The European Free Trade Association (EFTA) was founded on 4 January 1960 by Austria, Denmark, Norway, Portugal, Sweden, Switzerland and the United Kingdom to promote free trade and economic integration for the benefit of its four member states. Subsequently, other states joined, but most have since left EFTA and joined the EU. Today, the EFTA member states are Iceland, Liechtenstein, Norway and Switzerland. EFTA has trade agreements with more than 35 countries on all continents. More than 70 per cent of EFTA’s trade is with EU countries. On the other hand, the EFTA countries are the EU’s number three trading partner in terms of trade in goods. • The EFTA Convention, the legal basis for the organisation. • A worldwide network of free trade and partnership agreements. The Convention covers the trade agreements between the four member states, and it is the legal framework for EFTA as an organisation. Originally, the main goal was a framework for the liberalisation of trade in goods between the member states. Since the 1960s, it has developed and broadened through the addition of more agreements on the free movement of goods, labour and education. Norway also emphasises human rights, labour rights, the environment, cultural diversity, corporate social responsibility and sound public management in relation to EFTA’s FTAs. As regards trade in agricultural products, this is often managed through bilateral agreements between states. Some FTAs also cover the liberalisation of services, investments and/or government procurements. This is particularly common in the FTAs with South American countries and Ukraine, as well as several Far Eastern countries. Norway, Iceland and Liechtenstein have established the European Economic Area (EEA), while Switzerland has bilateral agreements with the EU. Through the EEA Agreement, Norway participates in the EU’s single market and the four freedoms: free movement of goods, labour, capital and services. Norway, Iceland and Liechtenstein cooperate in EFTA’s Standing Committee, which is the governing body on the EFTA side for handling questions relating to the EEA Agreement. The primary purpose of the committee is to act as a forum in which the EEA EFTA states consult one another and arrive at a common position before meeting with the EU in the EEA Joint Committee and the EEA Council. EFTA Surveillance Authority (ESA) ensures that Iceland, Liechtenstein and Norway respect their obligations under the EEA Agreement. • Actions for failure to act brought by an EFTA State or a natural or legal person against ESA. • Advisory opinions at the request of a national court of an EEA/EFTA State. The EFTA Council is the highest governing body of EFTA. It holds regular meetings in Geneva. The Council usually meets twice a year at ministerial level. The role of Council Chair alternates between member countries every six months. The EFTA Secretariat is headquartered in Geneva. It is responsible for the cooperation between the four EFTA countries, for supporting the Council and negotiating FTAs with non-EU countries. EFTA also has an office in Brussels that handles questions relating to the EEA Agreement. The EFTA Statistical Office is in Luxembourg. MPs from EFTA countries have met informally since 1963, and this cooperation was formalised in 1977 by establishing a separate committee. Since the entry into force of the EEA Agreement in 1994 there have in fact been two EFTA Parliamentary Committees: one committee that deals with EEA-related matters, and one committee that deals with all other matters. The two committees have a slightly different composition, in part regarding the numbers of members, and in part because Switzerland has observer status in the EEA-related committee. In practice, they have joint meetings and mostly function as a single committee. The committees have advisory status. The Consultative Committee is a forum for trade unions and employers’ organisations. It writes opinions and resolutions that are presented to the various authorities and bodies. Among other things, it discusses social issues relating to the EEA Agreement.